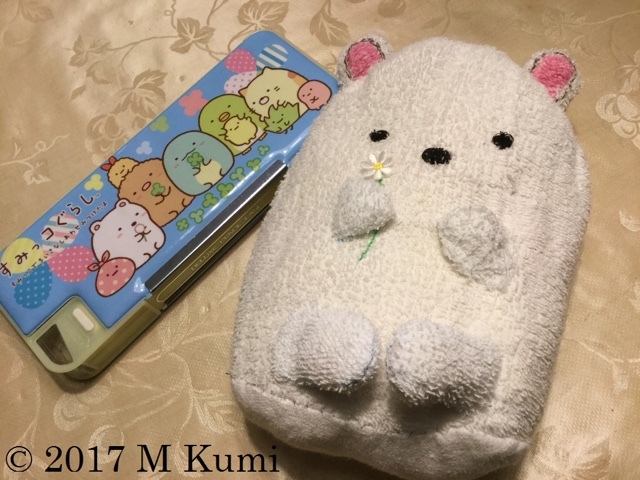 My husband made "Shirokuma (しろくま)" for our 6-year-old daughter during Golden Week. Shirokuma (White bear) is character of Sumikkogurashi (すみっコぐらし), which is very popular character merchandise among little girls. Sumikko means at a corner of a room, and Gurashi means "living". All characters of Sumikkogurashi like staying in a corner. It means Japanese people tend to feel more relaxed staying at the corner of somewhere, for instance, a corner seat of a restaurant, a corner seat of a train, and other places like that. "I want to have a Shirokuma stuffed toy!" "But these are expensive. All right, I will make one for you." "Really? Please don't make a promise which you will not be able to keep." "It's easy for me! I will definitely do it!" Our daughter was so excited to hear this. I wondered if he would keep his promise. He made it using a towel! "What an amazing dad! I can't believe!" I was so suprised and said. My daughter sew on its hands and feet. I was surprised at my husband and daughter's incredible work. Actually, I am not good at sewing. I am glad that she is handy like her dad. Those living in the corner character are very cute. I would say they would be popular with everyone here in England not just little girls. Japan always seem to have the ability to make the cutest toys. Your Husband should be proud of his sewing work. I also am not very good at sewing. I once made a bean bag owl, the sewing was so bad I ended up calling him "Wonky the owl". Wonky means crooked/bent/misshaped/deformed. All characters of Sumikkogurashi like staying at a corner. Reason: In English we usually say "in a corner" rather than "at a corner". I am not sure why. You version is grammtically correct also, just not said as often. It means Japanese tend to feel relax staying at the corner of somewhere, for instance, a corner seat of a restaurant, a corner seat of a train, like that. "I want to the stuffed toy of Shirokuma!" "But these merchandise are expensive. All right, I will make it for you." "But this merchandise is expensive. All right, I will make one for you." "But these (things/products/toys) are expensive. All right, I will make one for you." "Really? Please don't tell the promise which you will not be able to keep." Our daughter was so excited to hear it. "What a amazing dad! I can't believe!" Question: In the sentence above it is not entirely clear if you are saying it or your Daughter is saying it. I am assuming it is your Daughter but it may be better to state it. Wonky the owl sounds cute for me because I didn't know the meaning of the name (^^). I added a sentence at the last part to make who said it clear.